More than simply supporting organization change management, our organizational change methodology provides you a way accelerate change. Selecting and implementing significant organizational change is one of the most challenging undertakings an organization faces. If the change involves the entire organization — and also requires new paradigms that will replace established ways of doing business — the challenge can be extremely daunting. First, asking organizations to change the way they conduct their business is similar to asking individuals to change their lifestyle. It can be done but only with the greatest determination, discipline, persistence, commitment and a clear plan for implementing the change. Second, resistance to change is a natural human phenomenon. All people resist change, some more than others. Managing that resistance is an essential part of the process. Third, change creates uncertainty. Organizations generally achieve fairly predictable results with their existing business model. Their outcomes may not be the desired results, but they are predictable. Change is unpredictable. The results may be far better – but they may also be far worse. And success often looks and feels like failure until the change is very nearly completed. Staying the course of implementing a change – which is essential for its success – meets with continuing human and organizational resistance and pressure to pull the plug before the process is completed. An assigned Change Leadership Team. The Change Leadership Team is not necessarily a full-time, dedicated team. But it must be a team that is given the charter, the responsibility, the authority and the accountability for the full implementation of the required changes. If the change is organization-wide, paradigm-shifting or systemic, this may well be the senior management team of the organization. If the change is for a major subset of the organization, then a separate cross-functional team may be designated. In either event, the team must be clearly defined and allocated sufficient capacity – time, resources, and authority – to do its work. What is the general scope of this required effort by the Change Leadership Team? If the change is large scale and systemic, this team should be prepared to commit the equivalent of one full day per month for its collective work; the equivalent of one additional full day per month for individual assignments; and sufficient other organizational resources as required to delegate the lower level implementation tasks that will be required. WSA Canada works with organizations that are seeking to design and implement substantial change and would like some guided assistance in the process. By using a leveraged support model, WSA Canada works your Change Leadership Team bringing a validated methodology to the process. This leveraged model is predicated on the belief that the bulk of the work of designing and implementing change should be implemented by the employees of the organization. There are several reasons for this approach. When an external consulting organization is engaged to perform most of the work there is no internal organizational competence being built in the process. In addition, there is no commitment developed among the employees. Third, extensive external consulting adds significant extra cost. When the change is being implemented by an internal team relying only on the leveraged support of an external consultant these pitfalls are removed. In addition, the consultant brings the knowledge and skill of the change management methodology. Finally, the consultant’s visits become points of accountability. If the key milestones are tied to these visits they reinforce each other. Following are the key principles and steps in the organizational change acceleration methodology developed and used by Work Systems Associates Canada. The systemic model developed by Work Systems Associates has been tested and used successfully with many companies. It offers a comprehensive yet simple way of identifying and applying the leverage points that guide the change process. 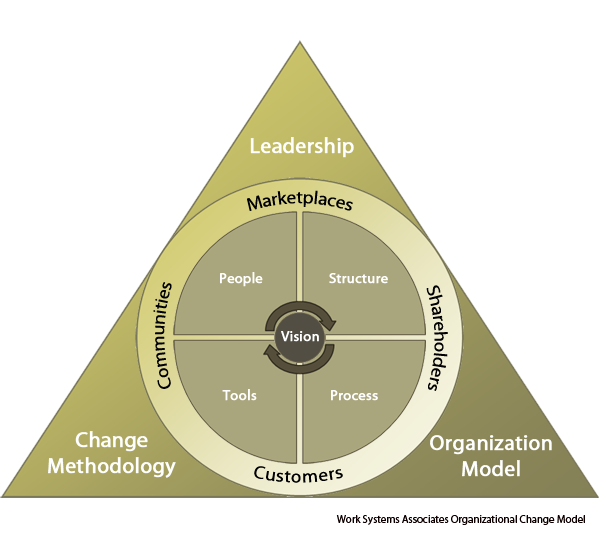 Work Systems Associates Canada’s Organization Change Management Model consists of the following integrated components: common vision, 4 organizational dimensions, environmental context, and 3 levers of change. The model starts with the organization’s vision. A vision is not simply the sentence that gets mounted on the plaque in the lobby. The vision must be sufficiently comprehensive to provide guidance and direction to every employee in the company. The next basic component is a clear understanding of the environmental context in which your organization operates. This includes the markets your company serves, its shareholders, its desired customer profiles, and its community relationships (including its business partners). 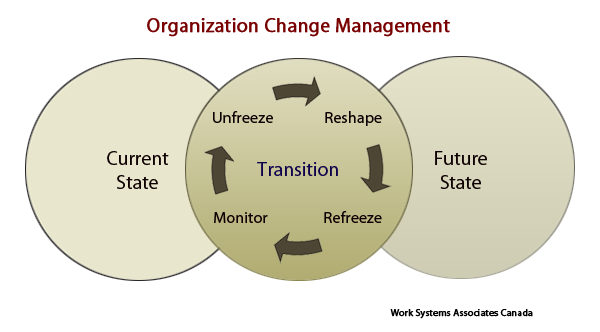 Once these two elements are defined, the elements in the middle of the model illustration is the organizational system. This system exists for only one purpose – to deliver the power of the organization’s vision to its customers. Every element needs to be examined and re-designed to make sure that it is “fit for purpose” – to deliver the vision to customers. The elements that comprise an organization are shown in the four quadrants: structure, work processes, people and tools. These are four key interdependent components. Structure is the traditional view of an organization. It is the “faces and spaces” diagram that is shown as an organization chart. It defines the boundaries of authority and decision-making and identifies the key personnel responsible for the business. Work processes describe how work gets done in an organization. They range from a few high-level cross-functional integrated core processes that drive the business down to detailed departmental processes and procedures. People identifies the skill sets needed for the company and the numbers of people with various skills. The essence of this category is about getting the right people doing the right job in the right place. Tools represents physical facilities and capital equipment – hardware and software systems, management and reporting systems, written documents such as policies, procedures and manuals, and compensation tools. An organization undergoing major change should examine all of these quadrants and assess their alignment to its vision, its customers and each other. This will enable senior management to identify the leverage points that will create sustainable breakthrough change. The single best lever is leadership — specifically, your senior management team IF they are truly aligned. When aligned, they speak with one voice and reinforce each other throughout the organization. If they are not aligned but give verbal agreement to change while proceeding with their own agendas, the organization loses its best leverage point. Actually, if the senior management team is not fully aligned and doing real work in designing the change together, they may become the biggest point of resistance. The second lever is having an agreed upon mental model of the organization. This common picture of how to examine the organization and approach change is essential to success. Otherwise, the senior team will argue about what to change and where and why. They will each have their own root cause analysis based on their own personal experience. And each story will have its validity. Full alignment can only be achieved if everyone understands and agrees to a common model. The third lever is a structured methodology to analyze the organization, design the change, implement it, and monitor progress until it becomes the natural way of conducting business. Without this methodology change will be sporadic, not sustained and employees will view the change effort as the “initiative of the week,” waiting until it goes away. A structured methodology based on a common model that is fully and completely implemented and supported by the senior management team provides the leverage for sustainable change. It is not uncommon for the process to begin with significant discussion about whether broad-based systemic change is needed, or whether smaller incremental improvements will do the job. This often requires some external data (market share, competitive information, etc.) as well as objective internal data (how long does it take to complete projects vs. plan; are costs per unit increasing or decreasing; is our organization getting better at what it does; is competitive positioning weakening, etc.). Boundary conditions define the limits (or playground) within which change might be considered. When senior teams begin their discussion some large topics usually emerge very quickly. Issues such as mergers, acquisitions, international or global initiatives, large capital investments, strategic alliance partners, equity situations, private vs. public ownership, etc. may be debated. While there is a natural propensity to discuss direction, clear definition is also needed on boundaries. Most senior teams are not likely to understand the need for for executives to properly define boundaries. A group of people aligned around a common vision are a very powerful force. John Kennedy’s vision of “put a man on the moon by the end of the decade” spurred NASA to unprecedented performance. Martin Luther King’s vision in his “I have a dream” speech energized the civil rights movement. Jack Welch’s vision for GE in which he said that “We will be number one or number two in every category or we won’t be in it” drove incredible energy and focus through GE. The vision of Mercedes Benz to “always make the best engineered car in the world” has been the hallmark of its focus for decades. The mention of work processes typically creates mixed reactions. Everyone agrees that some degree of process is required. Without defined processes a company would not be able to produce a consistent payroll. It would not be able to hire people. It would not have any consistent methodologies for its work. It could never assure any consistency or reliability. The problem for most cross-functional work processes is in the hand-offs. When processes cut across functions there are typically miscues and conflicting expectations or requirements between functional groups. Most companies have only a few core processes – about five – that drive their entire business. Everything else is an enabler. These core processes are virtually always cross-functional. Therefore, they must be developed by the entire senior management team – together. And that is the next step of the process of creating breakthrough change. Once these major cross-functional processes are developed – at a fairly high level – they can then be handed down to the next levels of the organization for more detailed implementation. One member of the senior management team must then be designated as the owner of the entire process – throughout the organization. This step typically surfaces the strongest points of contention in the entire breakthrough change process. If this step is addressed seriously, issues of organizational structure begin to resolve themselves. After all, the structure should be designed to support how the work gets done. Form follows function. Every company has a relatively small number of key roles that are central to its business. There are usually a number of people who perform these roles, and they are the linking pins for one or several core processes. Some examples of such key roles are: project director, lead engineer, national account manager, customer service representative, senior consultant, systems engineer, account executive, etc. The next step is to identify the few key roles in the organization that are central to how the company’s work gets done and then for the senior team collectively to define them. Most changes begin with a modification of the organizational structure. Unfortunately, most changes end there as well – which is precisely why most large scale change is unsuccessful. Step six represents the point where examining and possibly modifying the organizational structure is both appropriate and necessary. Structure should exist to support what an organization is trying to accomplish (vision and strategy); how it is trying to do it (core work processes) and the requirements people have for their work (key roles). Now that these have been identified, the structure should be reviewed and, if necessary, re-designed. The fundamental question is: Does the existing structure enhance or at least not interfere with how the work needs to get done? If the structure is helpful or neutral, the general guideline is to leave it alone. Structural changes are very disruptive. They should only be made if they are truly necessary. If the structure is a barrier to the work that needs to be done, then it should quickly be re-aligned to meet its new requirements. This analysis and re-design should be a collaborative effort by the senior team. If individual team members cannot “check their positions and their egos at the door” then it may be necessary for the President to impose the new organization. This step should be reviewed and implemented quickly, in its entirety, based on what best serves the needs of the whole organization. This is not the time to allow the “right of infinite refusal” to stall the change process. Every organization measures its performance. Unfortunately, most organizational measures have two fundamental flaws. First, there is a disproportional emphasis on financial measures. Financial measures are not direct performance measures. They are the consequences of company performance achieved or not achieved. By themselves, they indicate very little. Second, most performance measures cause the company to look through its rear view mirror. These measures indicate past performance and do little to help guide future performance or have a positive impact on organizational results. This next step calls for the creation of a balanced scoreboard – or dashboard – of the key internal and external measures that provide a comprehensive view of the organization’s performance, with as much insight as possible regarding their implications for the future. At the completion of this process by the senior management team you should have a limited set of defined measures that provide a balanced understanding of current performance, guidelines for improving short-term results, and the ability to assess and improve long-term organizational performance. Tools are powerful forces in defining how an organization behaves. An enterprise-wide tool can be one of the most dramatic vehicles to create (or force) organizational change. Enterprise software systems have become very powerful forces for driving organizational behavior, and potentially creating highly value increased productivity. Such tools require an organization to define how it conducts its business, and impose a discipline on all individuals and functional areas to conform to the standards and processes defined by the tools. However, if the tool is not sufficiently flexible or does not match how business is actually conducted, the effect will be disastrous. Tools that impose their way of working in conflict with established business norms or practices will be strongly resisted. Training is an integral part of organizational design and behavior. It is essential to ensure that individuals have the knowledge and skills to perform in their current jobs and prepare for new ones. Training is also perceived by employees as a measure of the organization’s commitment to them. In the current marketplace employees are encouraged to think of themselves as independent contractors selling their services for the best opportunity. Training (as a part of continuous learning) is an essential ingredient for retaining a nimble workforce. Training is one of the most powerful vehicles for a company to create breakthrough change. It can achieve three simultaneous results. First, it builds alignment to the desired change. Second, it provides individuals with the knowledge and skills to implement the change. Third, it creates the opportunity for cross-functional communication in the implementation of company-wide initiatives. Traditionally reward systems have been approached conservatively in the form of salaries for professional employees and hourly wages for non-exempt employees. In some companies annual bonuses or profit-sharing programs have been added, tied to organizational performance for that year. Companies have now started to use more sensitive vehicles to align reward systems to individual, team and organizational performance. Commissions for a sales force have long been in place. More recently, defined bonuses for the achievement of individual quarterly goals has become fairly widespread. Team rewards tied to specific project completion has also become common. Annual bonuses based on the achievement of specific performance goals are becoming the new norm. Though the techniques may differ, two dominant themes emerge. The first is the trend toward broad band job classification, providing much more flexibility in establishing individual compensation. The second is a much higher degree of at risk compensation tied to individual, team and organizational performance. If possible, reward systems should to be tied to the desired breakthrough change. Employees will pay great attention to adjustments in the reward system, especially if it is modified to focus on the desired behaviors and effects of the breakthrough changes. Change is challenging if the core disciplines of the organization are not designed for achieving effective rapid change. However, new disciplines for achieving effective change can quite easily be infused into an organization when the right methodologies are applied. WSA Canada works with senior leadership teams and change leadership teams to help guide them through this process. WSA may be contacted for further information regarding this process and discussions on whether there is a fit with WSA services. To discuss how this might work for your organization Contact WSA Canada Today.